Americans seeking a quick escape to a sunny tropical island will soon have a new option at their fingertips: A long-awaited $3.5 billion luxury resort development called Baha Mar is opening March 27 in Nassau, in the Bahamas. Nassau is just a three-hour flight from J.F.K.—and the resorts, on Cable Beach, are just a five-minute drive from the airport—so it will be an easy getaway for many in the Northeast. 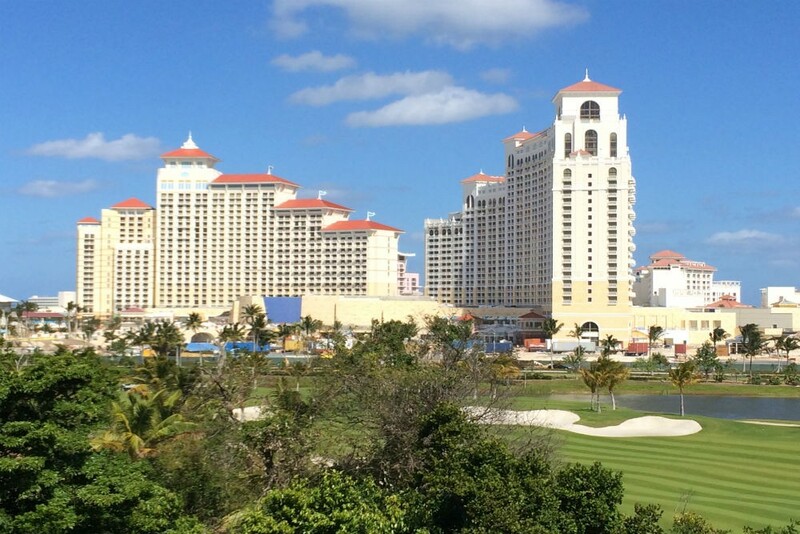 As I’m one of the only journalists who’s seen Baha Mar—I just happened to be passing through Nassau yesterday and went to take a look—I figured I’d share what I learned. Baha Mar will have four swank hotels— the Baha Mar Hotel & Casino, a Grand Hyatt, a Rosewood, and a SLS LUX—as well as a 30,000-square foot ESPA, a 200,000-square-foot conference center, and more than 40 restaurants, bars, and shops. There will be 3,000 feet of white-sand beach, a Beachfront Sanctuary filled with sea creatures, and a reef you can swim to and snorkel at. The development has already transformed Nassau—to build it, they had to move the prime minister’s office and two banks and reroute a road—but that’s nothing compared to the transformation to come. Nassau recently spent $410 million renovating its airport and building a gleaming new terminal, as it plans to grow airline service to the Bahamas by 400,000 passengers within the next year. There are even plans for flights from China. Who can guess what I’m checking out in #Nassau #Bahamas today? Hint: It cost $3.5 billion to build, and it opens March 27. Here’s the view of it from Go Slow Bend (where they go way too fast). The SLS LUX at @BahaMarResorts will have Fly, the first rooftop bar in the #Bahamas. You can bet that’ll be a scene. Opening March 27. With @paulgturnquest at the @BahaMarResorts golf clubhouse. Paul, the former newspaper editor (and awesome tour guide) who is Baha Mar’s PR Director, says that by 2016 400,000 more travelers will be flying to the #Bahamas annually and Baha Mar will be responsible for 12.8% of the country’s GDP. The development is transforming #Nassau, and the locals are excited about soon being on a world stage. And that’s all, folks, from #TheBahamianRiviera. Have you been to the Bahamas? What’s your favorite resort there? Don’t Just Visit Your Favorite Destinations. Wear Them. It looks nice, but I’ve read about China’s overhanded and unethical method of getting control of the property. As long as the Cheng family has an ownership stake, I doubt I’ll visit. There are plenty of other Bahamian resorts, and Caribbean resorts for that matter. I’m not a fan of these huge hotels. They overshadow the natural beauty of the beach. This is just my preference but than I’m a gal who went to Grenada in 1969 and St. Lucia in 1973 when their airports didn’t take jet planes., Also, enjoy the out islands of the Bahamas.